There are a few things I love ordering in restaurants because I never make them at home, either because my family doesn’t like it or it’s too difficult or I just don’t have access to the ingredients. Whenever I used to see artichokes on any menu, in any form, I would order them. I absolutely love artichokes, but I was always intimidated to try to make them so I looked at them as a treat. My grandmother used to make a fabulous stuffed artichoke, which really didn’t seem too difficult when she prepared them, but I was still confused even looking at a whole raw artichoke. I eventually learned how to clean and steam and artichoke and I have to say it’s really straightforward and not difficult at all. If you’re not there yet, head over to my video on how to do it. But grilled artichokes still seemed daunting to me. Until I found out those are no big deal either! Since I taught this recipe in my classes last spring, I have learned an even better method for preparing artichokes for the grill. 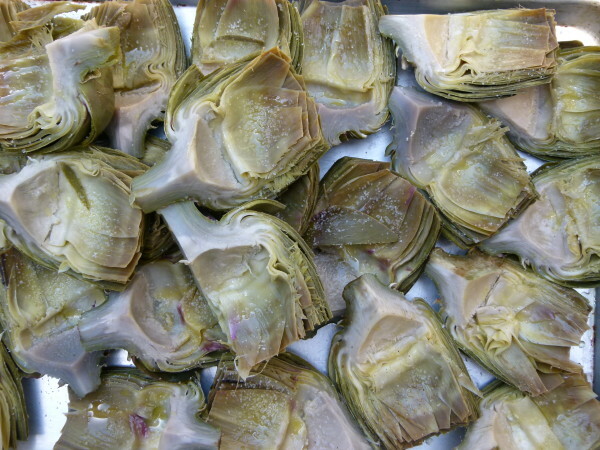 I steamed them whole last year and cut them afterwards which is a little tricky because the artichokes are already soft and some of the leaves come off when I tried cutting the artichokes in half. So I fixed that problem by cutting the artichokes in half (or quarters if they’re huge) before steaming. That way they stay nice and neat. Always learning with artichokes! 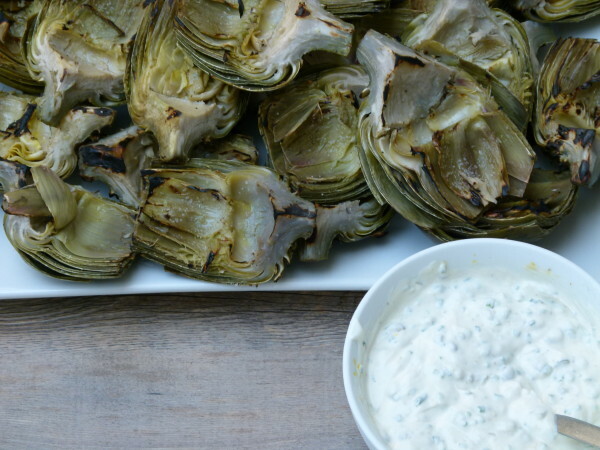 Personally, I love artichokes grilled more than any other preparation. The leaves pick up a great smoky flavor from the grill as well as a boost of flavor from a brushing of olive oil and a pinch of salt. 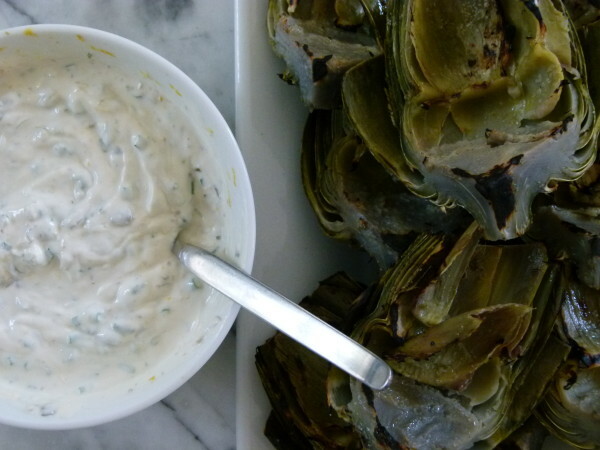 I taught this recipe with a delicious lemon-caper dipping sauce, but I think grilled artichokes are good enough to eat plain. After my instruction in class, everyone said the same thing, “that’s it? !” Yep, that’s it. Pretty easy. Although let’s not confuse “easy,” with “quick” or “instant” because preparing artichokes and cooking artichokes is not a quick job. It does require a little patience. 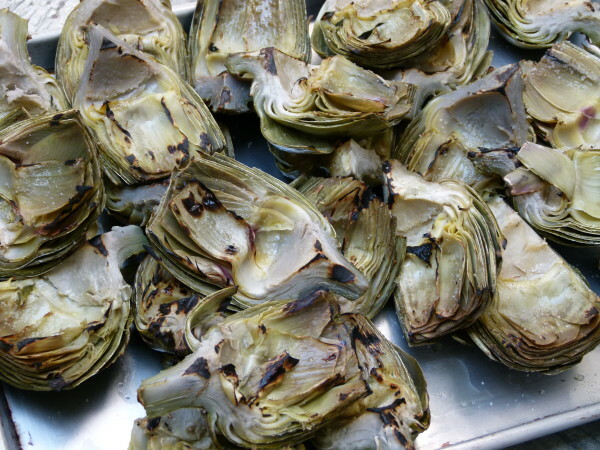 The great part about grilled artichokes though, is that you can steam the artichokes ahead of time, cool them and then you can grill them later in the day or even the next day. Perfect for entertaining or a busy weeknight. 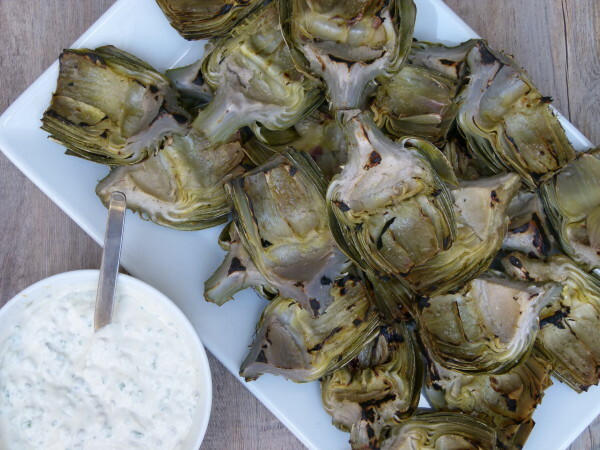 I think grilled artichokes are fantastic for casual entertaining. I say casual because you are using your hands and scraping the leaves with your teeth. Artichokes might be a little awkward to eat in front of the new boss or someone you don’t know very well. Just saying. The lemon-caper dressing shared here is just a suggestion. It’s kind of like a healthified remoulade sauce. The sauce would also be really nice on a simple piece of baked or broiled fish. I also like to dip artichoke leaves in a simple vinaigrette (click here for my two favorites) or aged balsamic mixed with olive oil and a pinch of salt and pepper. And please don’t forget to eat the heart which I think is the very best part and the easiest since you don’t have to work like you do with the leaves. If you’re not convinced to give these a try, read this post on all the health benefits of artichokes! Trim the artichokes: Remove the outer layer of small, tough leaves from the stem end. Trim the stem to create a flat bottom and discard cut stem. With a very sharp serrated knife (like a bread knife), cut off the top 1 inch of each artichoke. Use scissors to snip the tips of the remaining leaves. Cut the artichoke in half through the stem end. 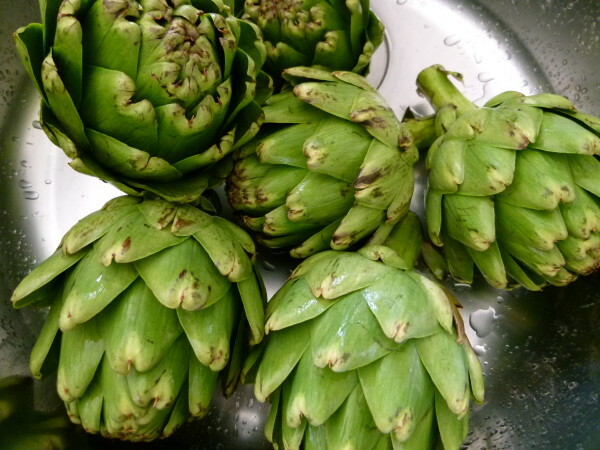 Cook the artichokes: put a steamer insert in a large pot of water and bring water to a simmer. Add artichoke halves to steamer insert and cover. Steam artichokes until stem can be pierced easily with a knife, about 25-35 minutes depending on size. Remove artichokes from the saucepan and set aside until cool enough to handle. Preheat the grill on medium heat. Make the sauce: In a medium bowl combine all the sauce ingredients and taste for seasoning. 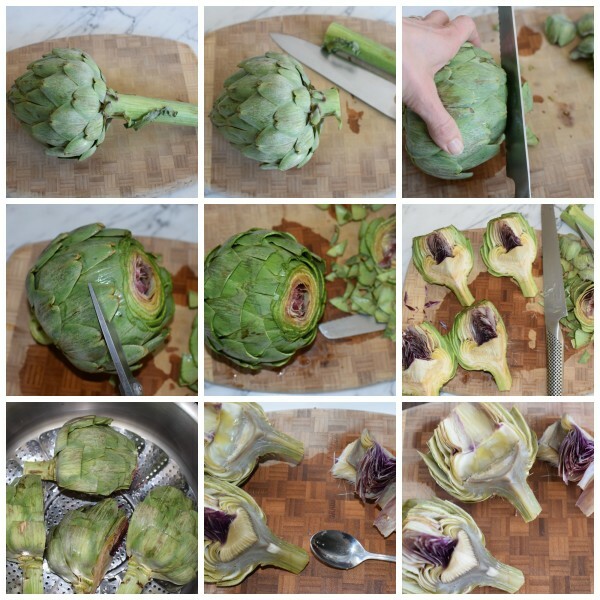 Remove the chokes: Pull out the lighter leaves in the center of the artichoke to expose the fuzzy choke. With a spoon, scoop out the choke (but not the heart) and discard. Brush inside and outside of the artichoke with olive oil, sprinkle with salt and pepper and grill until char marks appear, about 5-10 minutes. Flip over and grill on other side. Serve with lemon-caper dipping sauce. Loved it! I used an avocado mayonnaise and it worked really well with the recipe (in my opinion!). Thanks for sharing! Thank you for another delicious and easy recipe! These have become a fast favorite at our house. Artichoke season just got really exciting!!! And the sauce…so so good. Thanks Pamela! You are so welcome! Thanks for commenting and I’m glad you gave it a go! I don’t see any instruction in the recipe for use of the garlic cloves, bay leaf and lemon halves. Do they go in the steaming water? Thanks in advance. Good catch! I changed the recipe from the way I used to make them, which was to cook them whole in a pot with a little water and those ingredients. But since I cut them before cooking, it’s better to steam them. Thanks for letting me know about the error! Delicious! The sauce is fantastic! I served the artichokes with salmon, and the sauce was a great accompaniment to both. Thank you. So glad! Thanks for the note! Im so excited to try these, i love artichokes too! I wanted to bring these over to a friends house but have a busy day tomorrow – Do you think they could be grilled a day before and served chilled out of the fridge? Or do you recommend just prepping/ steaming then grilling before serving?